I've gotten many messages about this subject -- what to send, how many, how much should they cost -- that I realized my past posts may not been clear enough, and I know all of you are asking because you want to do your partner right. Thank you! 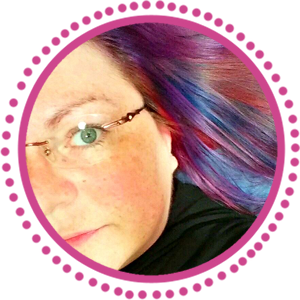 So here you go, as basic as I can make it (but still feel free to message me on Facebook or email me). 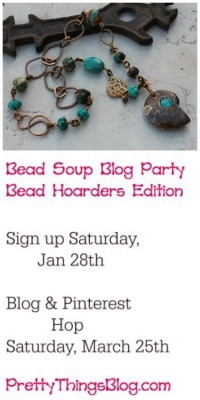 The name "Bead Hoarder" has been used before on Pretty Things -- I've had two blog hops specifically for this universal beader's phenomenon called "bead hoarding". Click here to see one of the sign ups and you can see some information. In this instance, though, you are SENDING your hoarded bead. And this can cause some consternation. Some beads you hoard are hoarded because they were expensive. Some are hoarded, as the beads above, because the designer no longer makes them. (ie: Jade Scott, Nancy Adams, Barbara Bechtel). And these factors can make them very difficult to give away, to intrust to someone else, and hope they will give your bead a good home. Remember -- everyone has a different income, a different stash, a different reason for using beads (hobby or business). It shouldn't matter where you fall in this. 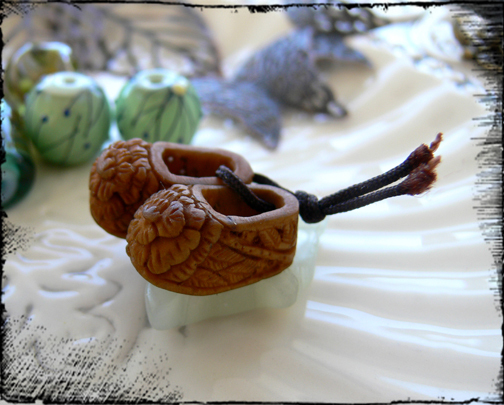 By MAKURaku, whose beads are always evolving, and no two are the same. As we're human, we also hope we'll receive equivalent beads to what we sent. This is where you have to have a leap of faith, a belief in paying it forward, a true desire to make someone happy with your gift, for it's indeed a selfless gift to send such a special bead to someone you probably don't know. that I then gave away on my blog as a treat. Please don't judge a book by its cover. 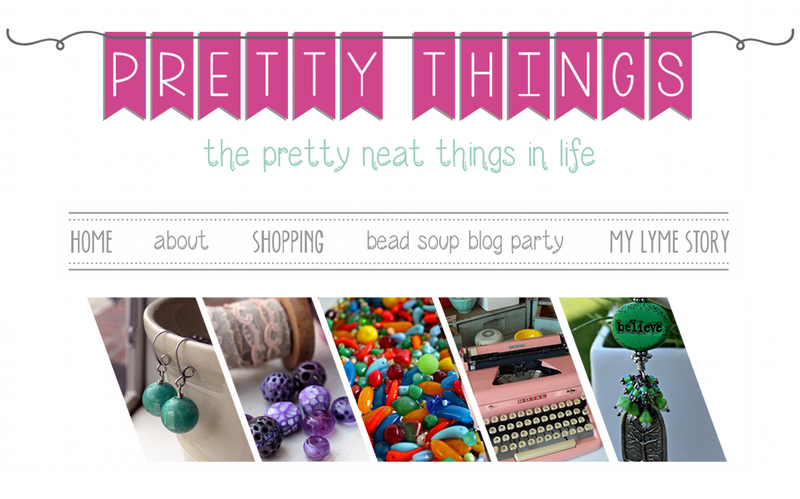 I'd rather you already had your beads packaged and ready to go before you visit your partner's blog page or shop or Pinterest page. It's so easy to judge people when what we're tying to do with this BSBP is not compartmentalize people by perceived talent or stash, and not to base your giving on that -- a perception. Whether you're a beginner or an expert, these are the basic rules. :: One bead, if it's a pendant or a focal, is enough. You may choose to send accompanying beads, but it is not required. A clasp is NOT required, although it's your choice -- if you want to, you can send one. It's just not required this time. :: You only need to use ONE BEAD in the Reveal. Just one is fine. Or use them all. 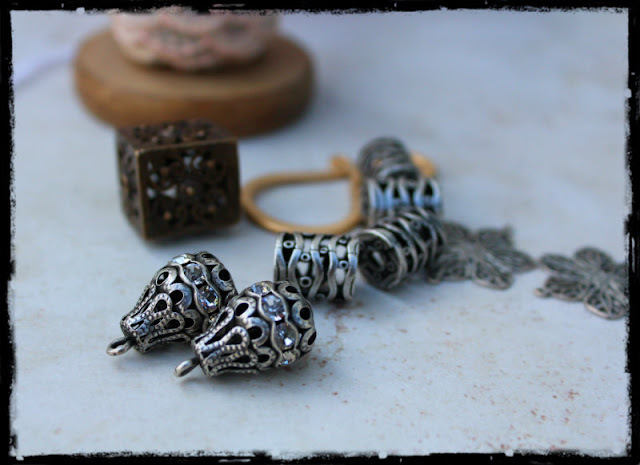 And by all means, dig through your stash to find beads that complement the bead you received. :: Give what you would like to receive. :: If you don't receive what you deem equivalent beads, keep in mind -- this was a gift, and you likewise sent a gift. 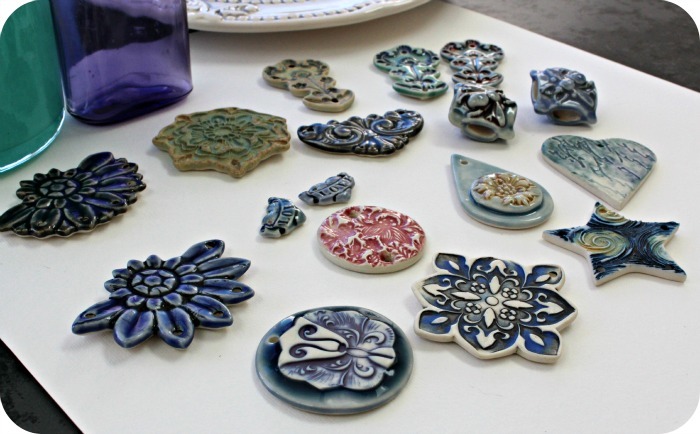 Don't forget, you can use your own gorgeous stash to round out whatever you choose to make with what you received. I made this pendant myself using a brass blank and DMC thread. The rest of the necklace is made with beads from my own stash. You can make something other than jewelry with the bead/s you were sent! 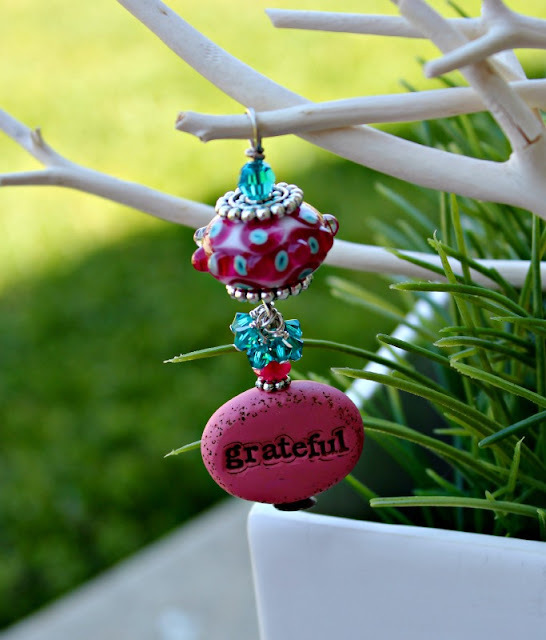 You can make a keychain so that special bead is with you daily. You can make a rear view mirror hanger, so it cheers your day as soon as you head off to work. 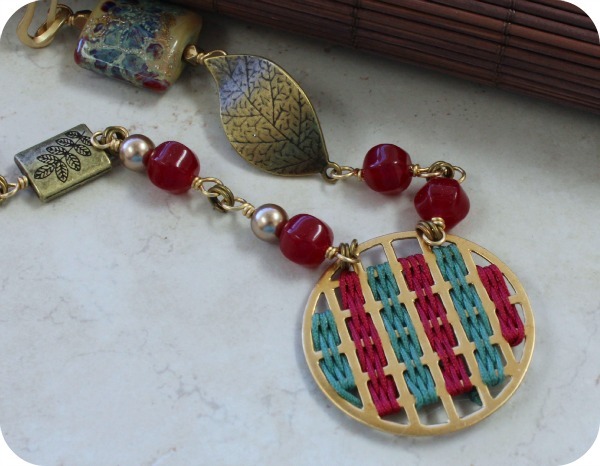 You can choose to string a special bead on a chain or cord, to keep the focus on the bead. 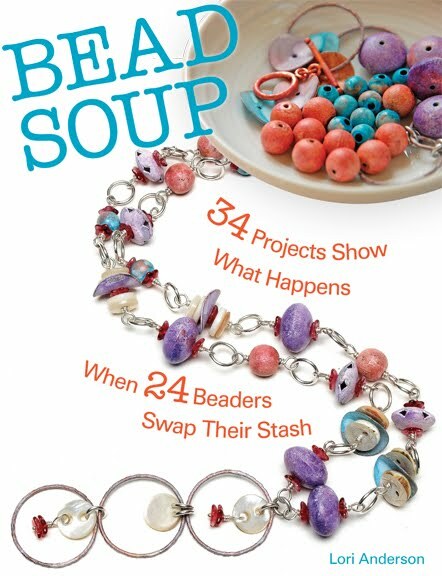 And if you receive a set of beads, you can break it up -- make both earrings and a necklace or bracelet with them! My own lampwork plant stakes. 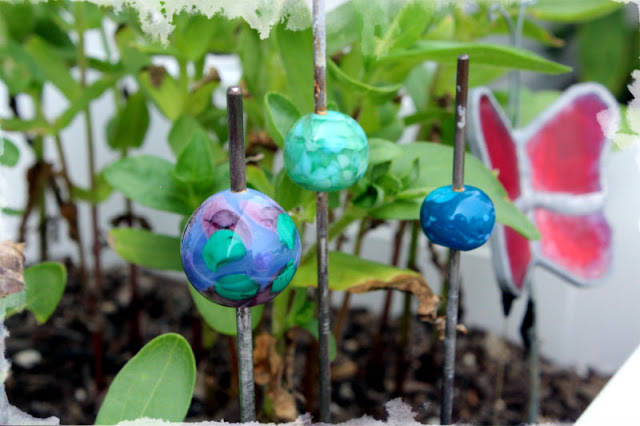 These became plant stakes because I couldn't get them off the mandrel, but you could alway glue your beads on, or make a creative wire stake that holds the bead in place with a circular dangle. These adorable beads were sent to me by Rebecca Anderson of SongBeads, and I loved just looking at them like this -- so I added them to a shelf in a glass cabinet full of vintage/antique baby items. 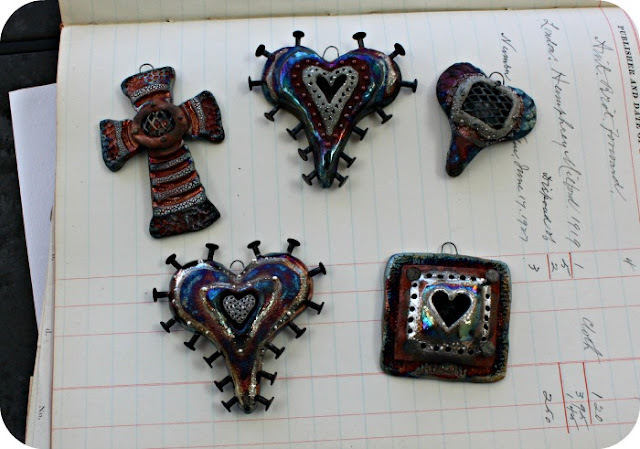 I made this for a Christmas ornament swap. The bead in the center is from one of my more spendy collections of Keysha Koy beads and I wire-wrapped the rest of the beads around a 10ga wire frame. The important thing is to give well, and from your heart. You don't have to send a ton of beads, although for some, like me, I like to send a bunch of coordinating beads -- as long as you are in communication with your partner that she doesn't have to use any at all (only one for the reveal, of course) and not to worry about making lots of things. All love and creativity -- no worry or fear, OK? Lastly, I'd remind you that you do not have to send a handmade bead. In previous posts, I showed commercial beads, gemstones, and vintage beads. They just need to be special to you in some way, and you need to convey why in a note to your partner. :: Beads that are commonplace in craft stores (Sending a strand of round Czech beads, not good. 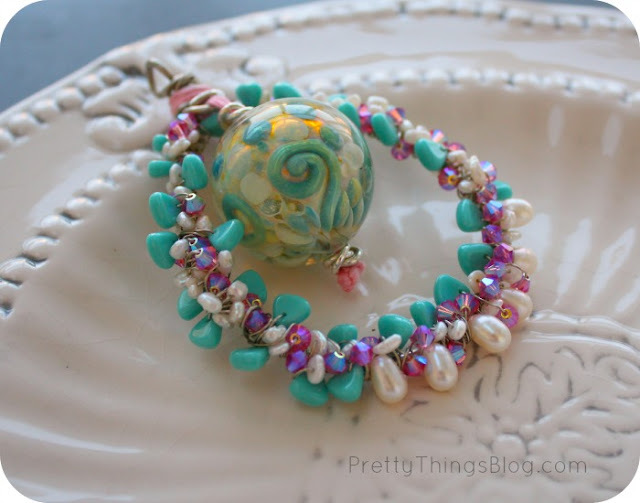 Sending a strand of vintage glass beads in a unique style, rather cool). :: Seed beads as a main component. A beaded pendant, awesome, Seed beads as coordinating beads, OK. Sending only seed beads, no please -- bead weaving is a special skill that can't be learned quickly enough for a blog hop. while digging through your own forgotten stash as well! I hope this is a better, more tidy explanation of what to send and why. Going at this with the intention of making someone happy is the perfect motive! I can't wait! I love the idea of getting something and figuring out how to make it my own.